Raith Rovers manager John McGlynn will put his league frustrations aside this Saturday as he looks to plot another famous cup upset at Easter Road. McGlynn led Rovers to a Scottish Cup semi-final in 2010 with memorable wins at Aberdeen and Dundee taking the club, and 7000 fans, all the way to Hampden. To reach the last eight on this occasion, Rovers will have to upset the odds again against a Hibernian side playing two leagues above in the Premiership. “It’s an exciting prospect,” McGlynn said. “We’ll be big underdogs and very few people outside Kirkcaldy will give us a chance. The Edinburgh club are currently without a manager following the controversial departure of Neil Lennon, and have only one victory in their last seven league games. McGlynn is hopeful it may be a good time to catch them. “Hibs had a great season last year but everyone knows they lost a few players in the summer and this year has not been as good for them,” he said. “They also play Celtic on Wednesday night so they can’t turn their attention to our game until Thursday. Rovers are expected to sell out their 1900 allocation for the game, and McGlynn hopes that a noisy travelling support can inspire the players to a big performance. “The response from fans has been absolutely fantastic,” he said. “People have really bought into this. Rovers go into the match on the back of a frustrating period of form in League One that has seen them pick up just one win in their last five matches, and fail to capitalise on Arbroath dropping points. “We’re doing a lot better than results suggest,” McGlynn said. “We just can’t kill teams off, and have a lapse that we seem to be getting punished for. “Forfar were on a great run and won at Arbroath the week before so you can look at the game and the amount of chances we created and say it was a professional performance with some really good football. “Should one kick of the ball ruin all that? Probably not, but the overriding fact is that it felt like a loss because it’s a repetition of things that have happened in the past and it’s hard to accept. “We did very little wrong and lost two points. “Not everyone will see it that way because most people are only interested in winning, and I’m certainly of that variety, and that’s why my demeanour after the game was of such disappointment and dejection. The January transfer window has closed but the loan market remains open to lower league clubs. 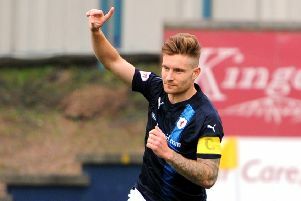 Raith currently have three loanees, giving them room for one more, but McGlynn is not expecting any further incomings. “At the moment I don’t envisage doing anything,” he said. “The board have been good in releasing funds to do what we’ve done, but there’s players gone out as well, so while there has been some impact, we’ve tried to balance it off.